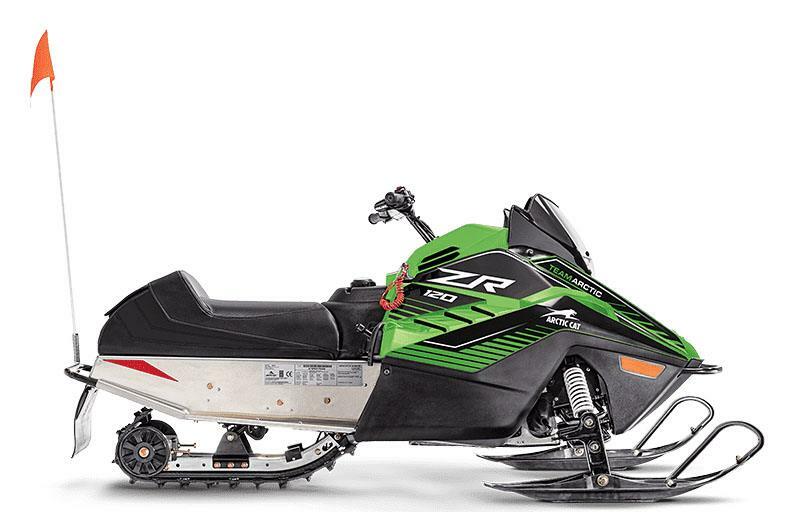 ZR® 120’s compact frame packs enough power and excitement to make your young rider’s first experience unforgettable. SAFETY FLAG AND TETHER SWITCH: A bright orange flag keeps young riders highly visible, while a tethered kill switch shuts the vehicle off when disconnected. A-ARM FRONT SUSPENSION: Just like on our full-size snowmobiles, this reinforced front suspension design helps young riders tame the trail. SLIDE-RAIL REAR SUSPENSION: This responsive rear suspension handles any bump in the road to keep the ride stable, smooth and safe. 123 cc 4-STROKE ENGINE: This fan-cooled 4-stroke engine starts easy and rides all day. And its governed to 8 mph to keep it safe but still packed full of all-day fun for your young rider. COMFORT GRIPS WITH HAND WARMERS: Ride all day, even when the wind chill dips down low. IN-SEAT STORAGE: Pack it in. ZR 120 features in-seat storage in the rear so you can stay out until sunset. HALOGEN HEADLIGHT: With low and high beams, you can light up any ride at the flick of a switch. COBRA™ TRACK: Cupped lugs give you better handling and control on soft terrain, and 1.0-inch paddles and traction teeth deliver all the grip you need. Overall - 35 - 37 in. 67 x 10 x 0.75 in.